Lily's Ink Pad: Homeade Valentines Oh My! 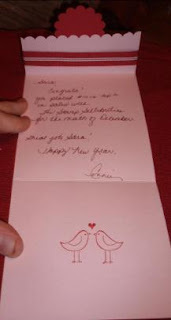 Although, I rarely am on time with Christmas Cards, I love to send Valentine's to those I love. Since I met Bubba, the holiday means a bit more! Sappy, I know. 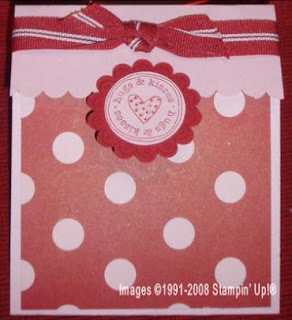 The other valentine I have to show you is one I made for the New Years Eve's Challenges on Splitcoast Stampers. The challenge was to make a "black tie" style card using Black, Silver, and White. I immediately thought of the set called from the Holiday Mini Catalog (which you can still get in the new Spring-Summer Catalog)! HOW COOL! Bubba is a Raider fan and silver and black have been a new part of my color palette the past few years! Shhh! Don't tell him! I doubt he reads this, so he won't know when he gets it February 14th! The picture just didn't turn out well. 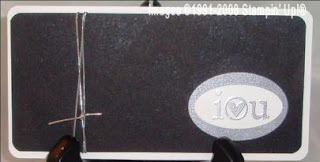 The flash took out the background imaging I did on the Basic Black with versamark and the large heart from that set. I hope you are finding time to make projects that help spread the love! Just a reminder: the Fall-Winter Catalog ends January 18th. Be sure to place any last minute orders of retiring merchandise or Inventory Blow-out orders ASAP! The Spring Summer Catalog is Here! Family Fun for the Ronald McDonald House! Inventory Blow-out, Stampin' Up! Style!